Save Whites Hill State College Oval: Have we been told the truth? 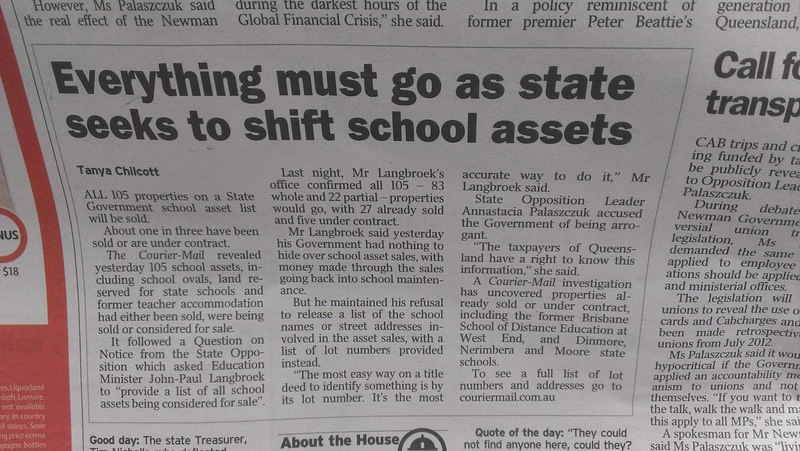 Today in The Courier Mail Minister John-Paul Langbroek (who still hasn't responded to requests for meetings or any inquiries via phone or email) has said that all the properties are definitely up for sale or already under contract. Ian Kaye and Steve Minnikin have told us there has been no decision made yet. Has the Minister not told the local State Members what is going on or are they being shy with the truth? There are legislated processes that have to be gone through when assets are sold, CONSULTATION is one of them, we are yet to have a conversation, let alone consultation. This will be my first question on Friday night 14th June 7pm at the Whites Hill State College Hall. Click the link to find a partial list of properties with addresses, some are still listed as Lot numbers only.